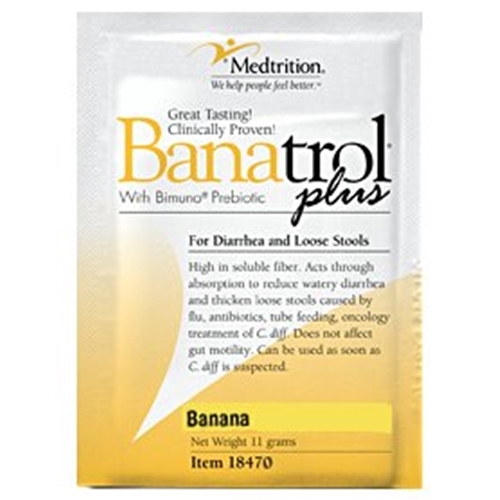 Banatrol Plus Banana Flakes from HealthyKin.com are specifically formulated to provide nutrients for the dietary management of diarrhea without medication. A dual acting combination of natural banana flakes and prebiotic to control the severity and length of time patients suffer from diarrhea while enhancing the good bacteria in the gut. Banatrol Plus does not affect gut motility and will not cause constipation so it can be used as soon as C difficile is suspected. Conditions: For the dietary management of diarrhea caused by infectious disease and flu, antibiotic induced diarrhea, C. difficile, tube feeding associated diarrhea and chemotherapy induced diarrhea. Banana-flavored Banatrol Plus is unsweetened and typically added to a moist food or beverage for oral use. Stir one packet into 120 mL of water or fruit juice, or moist foods such as applesauce, yogurt, pudding and oatmeal. I have very,very, severe diarrhea, which is constant and have had it for years, so I wasn't surprised when Banatrol hasn't helped,but in order to be fair and give it a chance to work I have ordered the 2nd case of 75. Over the past 8 to 10 years I have tried many things and so far nothing has stopped it, so if you have any suggestions I would welcome them! My 86 year old father is experiencing the side effects of his medication. He swears by this product. He puts a pack in a half cup of applesauce each morning and the loose stools are much less frequent. He likes the taste. The product was recommended by an Oncology Nutritionist and does the trick. I'd have given it a perfect rating except the individual packets arrived very sticky on the outside. Good Product. Fast Service. Stopped my diarrhea. Excellent results in stopping C-DIF infection, especially when given with Acidolphus and short term antibiotics! Quick delivery and fair price. Stops my diarrhea from gvhd. Stopped Diarhea from gvhd. Very quick delivery. Price a little high. I love this product. The Dietician put me on it in the hospital. It is nutritious and I add it to my applesauce along with a scoop of collagen and cinnamon each morning. I recommend it.